If Scorched Ruins would come into play, sacrifice two untapped lands instead. If you do, put Scorched Ruins into play. If you don't, put it into its owner's graveyard. Bedevil has been tested and I think it is a good replacement for Putrefy , or potentially working in tandem. 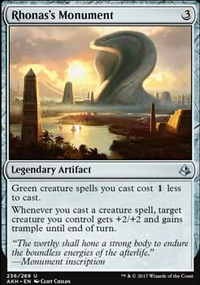 While on paper Deserted Temple seemed like a good addition for mana fixing, the only real synergy it has in the deck is untapping a Cabal Coffers with Urborg, Tomb of Yawgmoth . Deserted Temple generally works a lot better when paired alongside lands like City of Traitors or Scorched Ruins but since this deck doesn't play either of those options it is a prime candidate for cutting. The most likely replacement is another basic Forest . Vesuva covers the same angle, but with far more flexibility. Worm Harvest is another candidate for replacement. In a grand total of one game I have cast this spell, and the advantage is that it can be reused from the graveyard but unfortunately it is slow strategy (even for this deck) and is an inefficient way of getting land into the graveyard even if that becomes the main reason for using it in the first place. More and more I find myself falling out of love with Wayward Swordtooth . Early game it provides some slight ramp, but ultimately a 5/5 that doesn't block effectively for Lord Windgrace until we get city's blessing is underwhelming. 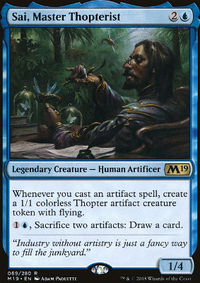 Especially in that critical 3-drop where we would otherwise want to cast an Azusa, Lost but Seeking for even more land drop potential (especially with Crucible of Worlds ) or Harrow for mana fixing. I've also had a change of heart of Journey to Eternity Flip. 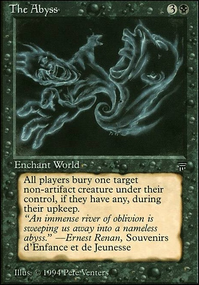 This has mainly become tech against sacrifice-based strategies such as Sheoldred, the Whispering One or any deck playing Grave Pact / Dictate of Erebos . 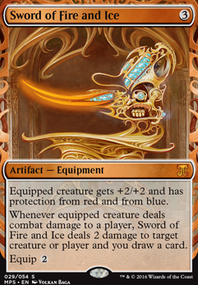 The primary issue with Chandra, Torch of Defiance is that her uptick for quasi-card advantage can exile an essential land with no chance to bring it back, but she does represent another win condition with her ultimate (even if it is slow). If you are only using Chandra for her mana uptick, I think that it's a waste as a 4-mana ramp spell. Whereas Nissa, Vastwood Seer Flip provices something the deck really likes doing: ramping or drawing cards. The downside of this Nissa is that her downtick is not fantastic, but I guess it provides a blocker to help protect her or Lord Windgrace . 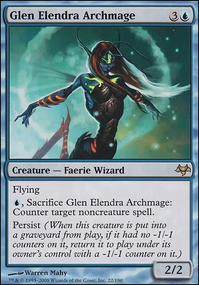 Further her ultimate (turning 6 lands into 6/6s) leaves lands vulnerable, but also represents a potential game-winning swing *(note that this does not give the lands haste so this has absolutely no synergy with anything that brings land back from the graveyard to the battlefield or making extra land drops as they would be subject to summoning sickness and would not even be able to tap for mana if you were planning of using it for Exsanguinate or Torment of Hailfire ). It's bad. Better options include Ancient Tomb , Crystal Vein , City of Traitors , and Scorched Ruins . I have not seen the deck either but I saw someone use Mana Reflection and Cascading Cataracts to make . Those cards are so good together. So are all the filter lands. Like Wooded Bastion it taps for or or but with Mana Reflection it taps for or or . Just a really good few cards I recommend. Also any other land that produces 2 or more mana is good with the reflection. Scorched Ruins taps for but with the reflection its but I wouldn't recommend Scorched Ruins or Lotus Vale. there a elf that does the Chromatic Lantern effect to I forget its name. Ancient Tomb, Scorched Ruins and Mirage Mirror would easily find a spot in this list. Palinchron, Frantic Search, and Snap would give you more untap engines and would also give their own benefits as well. 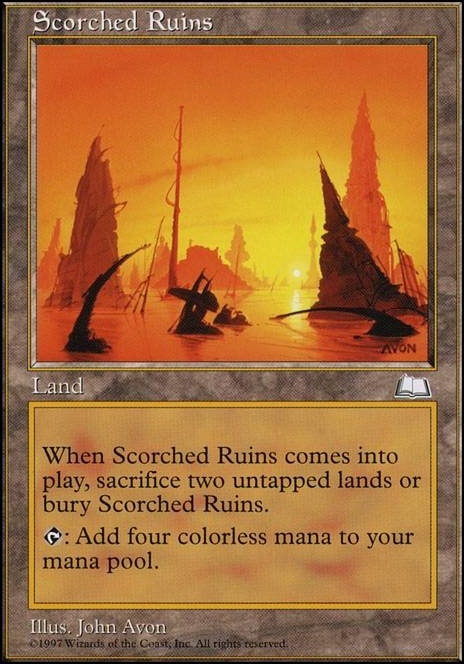 Scorched Ruins is an interesting land you might have to play around with but untaping it would be a godsend.